In ir/rational you complete, create and discredit arguments by selecting propositions and filling in the blanks. It's a puzzle game based on propositional logic, and a graphic adventure all in one - only here you don't so much need to escape the room as prove why you'd even want to. 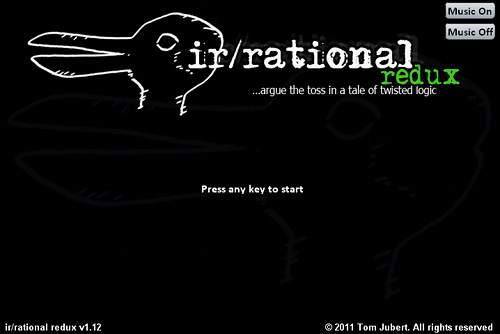 - Dark philosophical comedy by Tom Jubert, writer of Penumbra, Driver: San Francisco and FTL. NB Some systems don't display all the dropdown options at once, and you have to use the arrow keys to scroll. If you can't see the right answer, chances are you can resolve the problem with the arrow keys. Hope it's not dampened your enthusiasm!